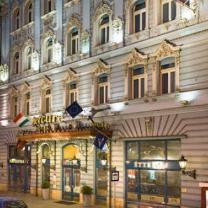 4-star-hotel in the 8th district of Budapest. Address: 1088 Budapest, József krt. 4. The hotel has 76 rooms. Budapest Nemzeti is set in a grand 19th-century building with an ornate, baroque-style facade, this upscale hotel is a 3-minute walk from a metro station. Sophisticated rooms and suites feature free Wi-Fi, flat-screen TVs and minibars, plus tea and coffeemakers. Featuring sleek, modern decor. Hotel Nemzeti Budapest has 76 sound-proof rooms with air-conditioning, bathroom, colour TV with satellite channels, and radio, phone, minibar, safe, room service and 60 rooms with PC-connection.